Four Row Cylindrical Roller Bearing manufacturers, Four Row Cylindrical Roller Bearing exporters, Four Row Cylindrical Roller Bearing suppliers, Four Row Cylindrical Roller Bearing OEM service. 1. 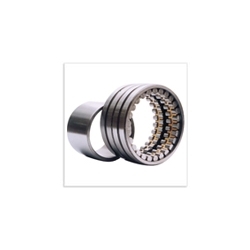 Cylindrical roller bearings are available in many designs, dimension series and sizes. The majority are single row bearings with a cage. Single and double row full complement bearings (without cage) complete the standard assortment for general engineering. Bearings with a cage can accommodate heavy radial loads and operate at high speeds. Full complement bearings are suitable for very heavy radial loads at moderate speeds. 2. In cylindrical roller bearings, the rollers are a key component. Their geometry, the so-called logarithmic profile, provides an optimum stress distribution in the contact zones in the bearing. Their surface finish maximizes lubricant film formation and ptimises rolling motion of the rollers. The benefits derived from this compared with traditional designs include enhanced operational reliability and a greater insensitivity to misalignment. 3. The ring with the integral flanges together with the cylindrical roller and cage assembly can be separated from the other ring. This results in easy mounting and dismounting, particularly where the load conditions are such that interference fits are required for both rings.